It's not easy to promote comedy events in general but comedy events with a political angle are even harder. Online listing sites are often reluctant to put up an event that they think is partisan. One such forum is Chortle, the leading comedy website. They would not put up a listing for Stand up for Labour. Nor would What's on London, but surprisingly Time Out did. It is a bit hit and miss. Similarly it is difficult to get cafes or hairdressers to put up posters or leave flyers with them. I would often find that a poster that had been put up would be put down within a day and this is a costly exercise if you consider a colour A2 poster costs nearly a £1 to produce. I found the best way to get posters up was to pay for them to be put up in newsagent's windows. If there is a financial transaction it is not as if the newsagent is endorsing any political party and people are likely to take money for anything nowadays. I paid one newsagent £5 for an A2 poster to be put up in their window and I can trace four tickets as having been sold directly from this (the people who bought the tickets by phone told me so). I therefore made the money back. 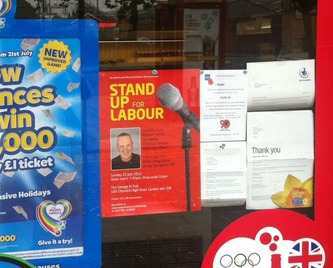 Posters in newsagent windows also show the Labour presence is out there whether people actually buy the tickets. A good way to promote Stand up for Labour gigs is Twitter. Hammersmith's MP Andy Slaughter retweet of the event to his thousands of followers brought about the sale of about 20 tickets. But ultimately the best way to promote a forthcoming gig is through the Labour members' database. If members know that a big name speaker as well as a top comedian are coming to a venue near them it is likely to get noticed. That is why Stand up for Labour would only require members' contact information as a condition for organising the whole event. And my hope is that people will follow @standup4labour on Twitter so it is easier to contact a lot of people at once. It would also be a way to offer deals on tickets. Awesome Post! As, i love to watch and Buy Comedy Tickets UK. I was at the stand-up on 22 July, with several friends, including some who'd come over from Belgium especially, and one a Spaniard. I may be biased - of course! - but I'm not lying when I say that everyone was over the moon with the evening, and thought it the most brilliant idea for a long time to promote Labour, its ideas and people, in a fun, enjoyable, yet intelligent and unforgettable, and democratic way. More, please more!!!! !